Today we examine Noctua’s new fan, the NF-A12x25. After more than 4.5 years of development and seeing prototypes throughout that time, the new fan has finally been released. The NF-A12x25 uses different build materials to increase rigidity which allows for tighter tolerances, specifically in regards to the distance between the blade and the frame. Noctua says the design will help increase static pressure and airflow making this fan a good candidate for mounting to a radiator. 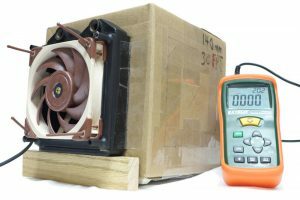 We put the fan to the test to gauge performance and see how the new fan fared against other similarly sized fans. 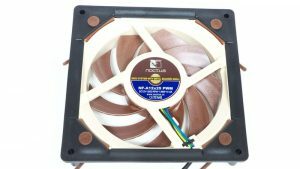 As always, Noctua has a lot of information on this fan which starts here. 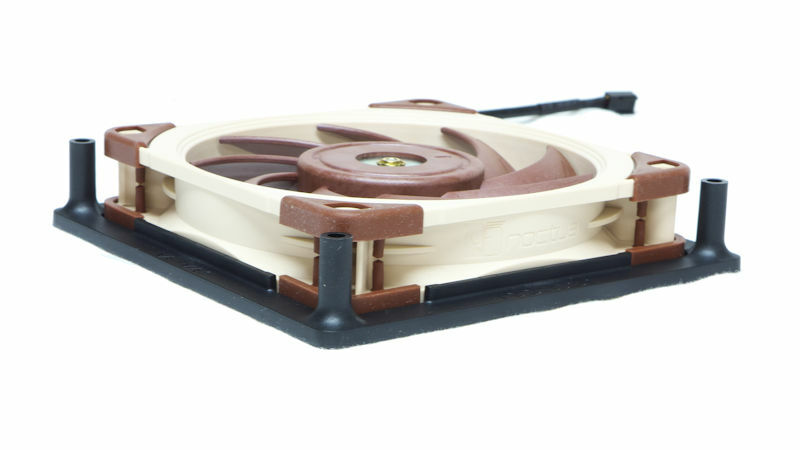 Noctua begins with Flow Acceleration Channels which redirect air flowing along the top surface of the fan. They move on to Sterrox, which is a liquid crystal polymer like Kevlar that allows them not only to build a fan where the blade tips come to 0.5 mm from the frame (less creep) but also dampens vibration (less noise). One thing that they do not advertise is acoustic notches. You can see them on the blades of Gentle Typhoons and they advertise their presence on the NF-P12, but will not find them on the new fan. The A12x25 uses SSO2 bearings stiffened with steel and brass and are said to be much much quieter than other bearings. This is sturdier and reinforces the whole impeller allowing for less creep and noise. 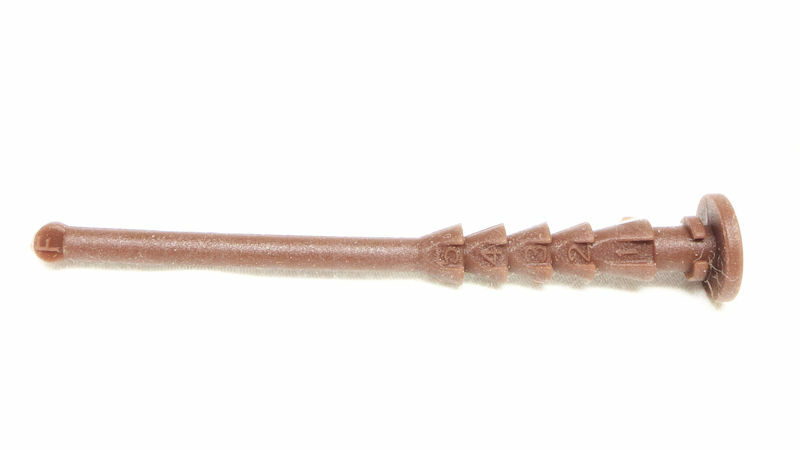 In turn, the close approach of the blade tips means there is less of a boundary layer so the microstructures can be smaller than in antecedent fans. So what does this mean for the user? 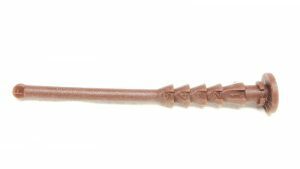 The tight tolerances between the blade tips and the frame let less air escape when it is used against resistive loads like radiators. 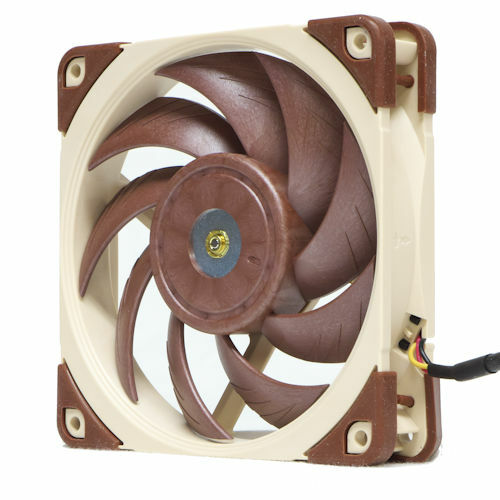 Given that, the fan will blow a lot of air through a case as well, it is truly a fan for all occasions. 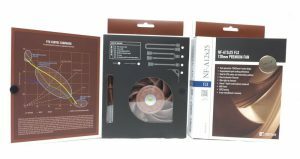 A few miscellaneous features: integrated anti-vibration pads, noiseless switching circuitry, and Noctua’s famous six-year warranty. 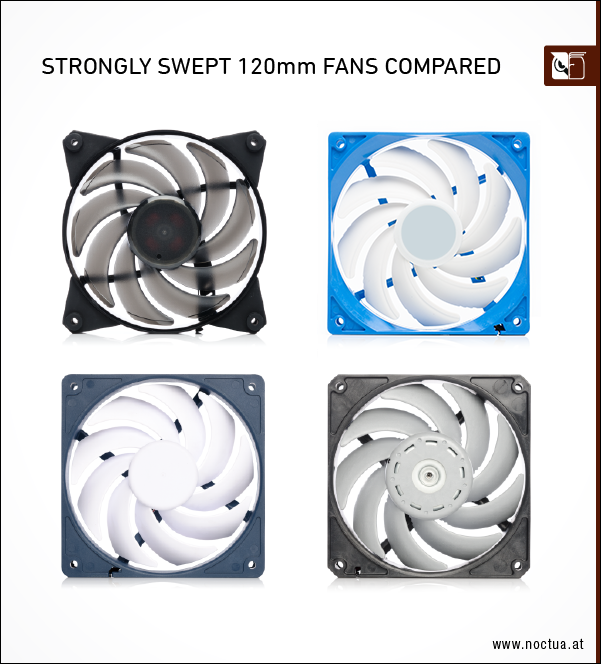 And, lastly, they do compare the A12x25 to other strongly swept fans. The fans seen in this review were provided by Noctua – a pair each of PWM, FLX, and ULN. Since all the fans had the same dimensions and build materials/design those specifications were omitted in the following tables. 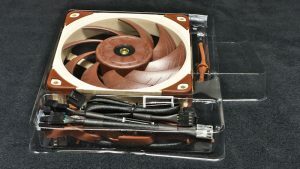 Noctua premium fans come in boxes that have flaps on the front and back that reminds one of books. 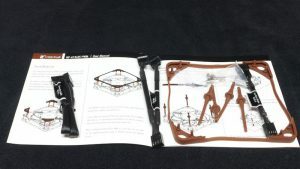 On the inside of the front flap is the PQ diagram and on the front of the box is a diagram of the included accessories. Under the back flap, there are diagrams and descriptions of the various features of these fans. 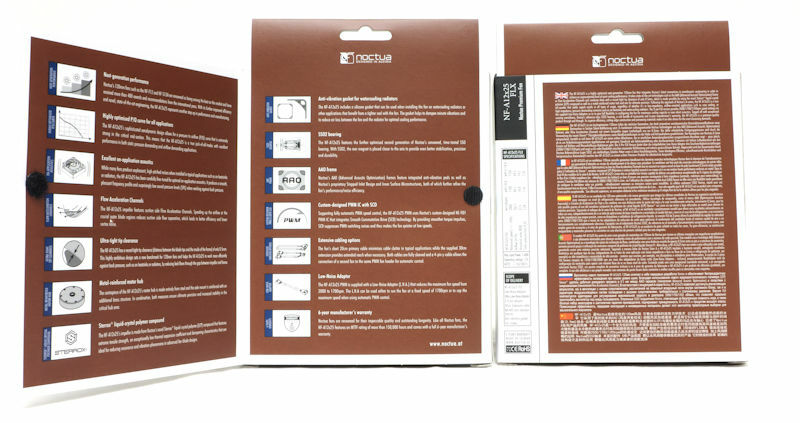 Also on the back, we see descriptions in multiple languages. 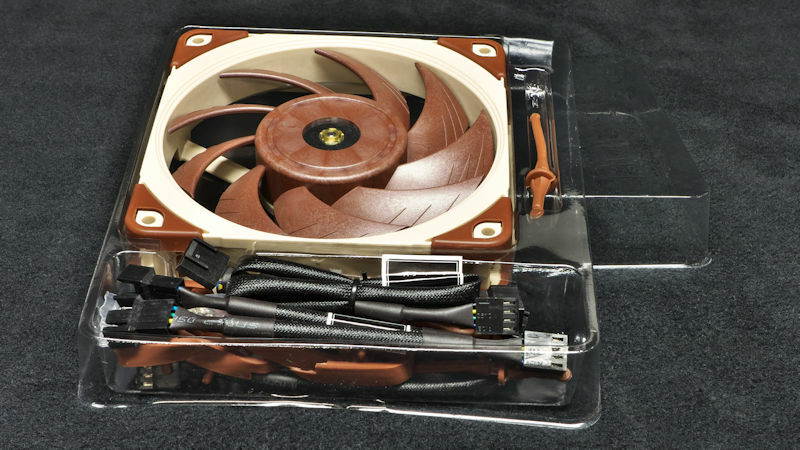 When a user slides the fan out of the box we note it is packed in a clear plastic suspension case to keep it from harm and the accessories organized. Here the accessories are laid out on top of the paper manual. Going from left to right, we have a folded 8”-200 mm extension cable, a Y-cable, and an anti-vibration gasket for radiators surrounding four vibration isolators, four fan screws and a Low Noise Adapter (LNA). There is an electronic version of the manual online, a .pdf file is here. Next, we have an NF-A12x25 set up to be a pull fan on a rad with the anti-vibration gasket for a radiator on its pull side. Further, it has reinforced corners, with walls that flank the screw path on two of the corners and cupping, that half surrounds the screw paths on the other two corners. The Noctua marketing rep wrote to me that the corners needed additional stiffening “…due to the ultra-tight tip clearance. The problem was that when the fans were mounted e.g. on a radiator and the screws were overtightened slightly, this would cause the corners to flex and this flex also affected the inner part of the frame, so we were in risk of the blades touching the frame. The new corner design is much stiffer and avoids this risk.” Finally, it has the walls on one corner and the cupping on the adjacent corner pointing in the same direction. 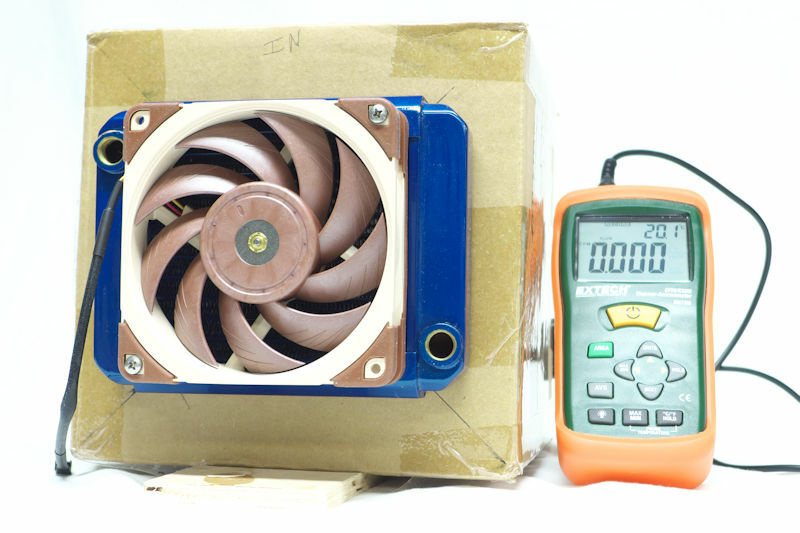 This allows the mold to be removed from the fan’s frame after the plastic has been injected and the frame has cooled. Zooming in on the fan, the stepped inlets are very clear, as are the flow acceleration channels. The microstructures are so faint it is hard to see them. They are there, though, even if they are so small they seem like optical illusions. Occasionally, users need to mount a 120mm fan in a 140mm space and in many cases, 120mm holes are not there to mount the fan. 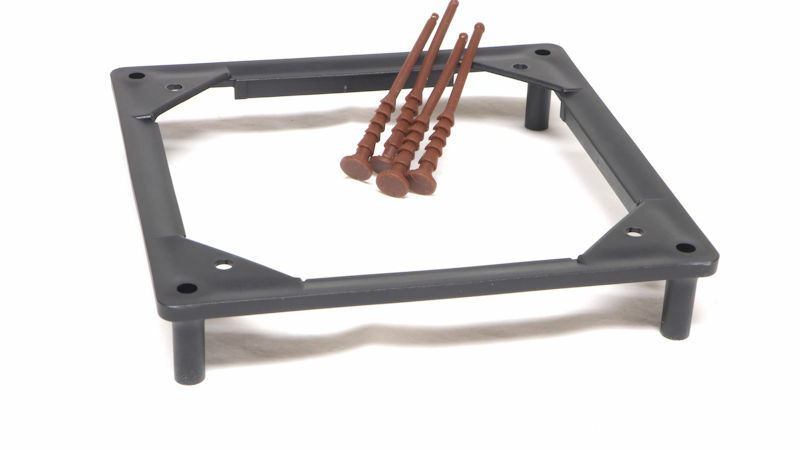 To that end, Noctua has created the NA-SFMA1 bracket that fits around 120mm fans and extends the mounting points to 140mm. The NA-SFMA1 adapter design includes small lips which line the straight sides of the fan. Its job is to keep the air from the smaller fan which is mounted to a larger rad from escaping, thus keeping the same properties as if it was mounted in a ‘native’ 120mm rad. 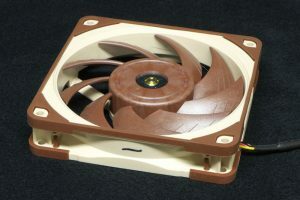 The bracket should be able to accommodate other fans that do not come with a gasket and still achieve similar results. The other Noctua fans come to mind. 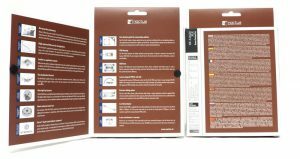 As Noctua says, these soft silicone vibration isolators fit “both standard open corner fans (pawl 1) and 10, 14, 15, 20 or 25mm thick fans with closed corners (pawls 2 to 5). This makes the NA-AV4 ideal for slim fans where other anti-vibration mounts may not fit properly. With their flat case-side end, the NA-AV4s are flush with the case panel and thus provide a clean exterior look.” “Pawls” are wedge-shaped swellings in the vibration isolator that hook onto a fan preventing the isolator from pulling back out. The ring of rubber to the left of the numbered pawls is meant to sit between a case, or this time, the NA-SFMA1 and the fan. 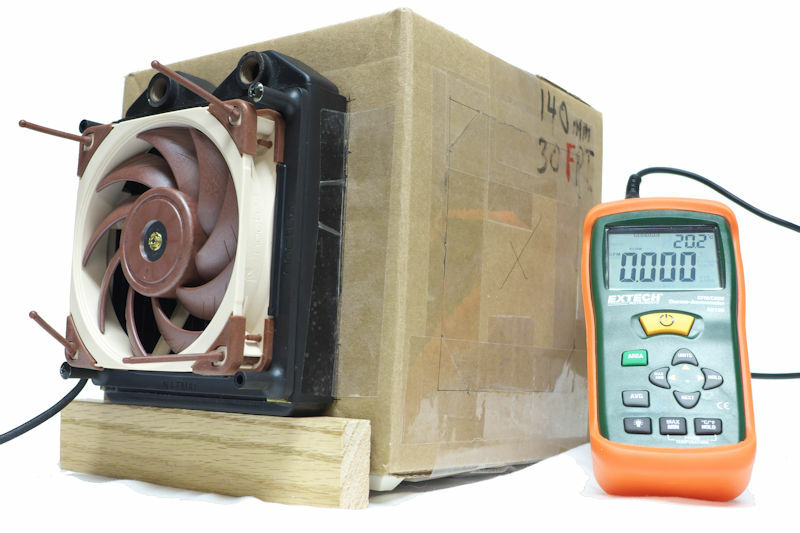 It holds the fan apart from the case or from the adapter, isolating it from any vibrations the fan may produce. The right picture shows the business end of an NF-A12x25/NA-SFMA1. The vibration isolators are showing their flat ends. This fan has been thoroughly nestled into a 120-140 mm adapter. It is ready to be screwed down on a 140 mm rad. In the next image, we can see the adapter has been bolted onto the radiator. We are able to see the first pawl holding the fan’s flange as well as the fingers of the anti-vibration corner pieces sticking through the flanges on both sides of the frame. Users can grab some needle nose pliers to give these fingers a tug to make sure the corner pieces or the gasket, which fastens the same way, are secure. The fans were placed in a test stand where their free air RPM was observed and noise levels were assessed. The standard proxy for what one can hear is the Sound Pressure Level (SPL), measured in decibels with a type A-weighting (dBA). A silent room is about 30 dBA. 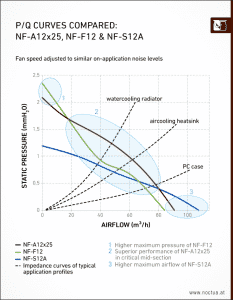 The airflow was assessed using a standard measure, cubic feet per minute, or CFM. The air entered a sealed 8″x8″x8″ box (200+ mm on a side) where it was allowed to mix. 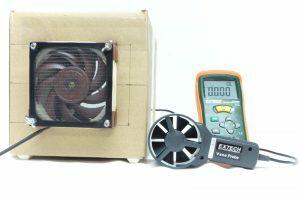 The air leaves the box through an exhaust port, where it is measured with the vane head of an Extech AN100 anemometer, averaging 10 readings per fan setting. 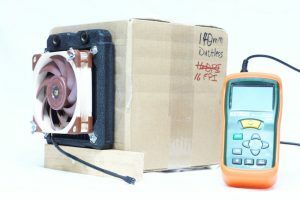 The fans were tested in an unobstructed state, with a metal mesh dust filter, on a 16 Frame-Per-Inch radiator as a proxy for heatsinks, on a 30 FPI 120 mm rad with the gasket and on a 30 FPI 140 mm rad with a 120 -140 mm adapter. Note that the HSF proxy leaves a lot of open space on all four sides of the fan. We will look at the performance of the NF-A12x25’s as case fans. Follow the CFM results by looking at how far the middle bar reaches to the right side. 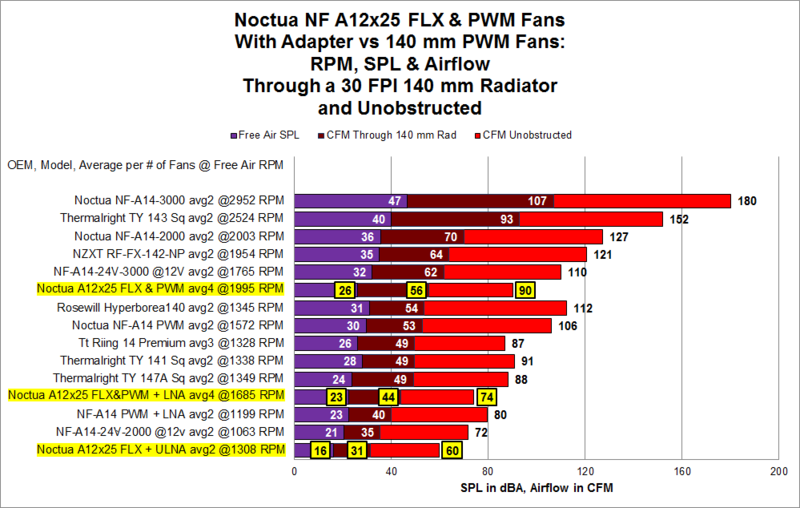 The unobstructed CFM results are what fan OEM’s quote users. They are a bit misleading because most enthusiasts use dust filters. However, it is a standard so we include it here. But the middle result is the main result in this chart. The charts can be expanded for easier viewing by clicking on them. First off, the PWM and FLX without Low Noise Adapters made phenomenal case fans. We pooled the results because the fans performed so close together. So we averaged four fans. 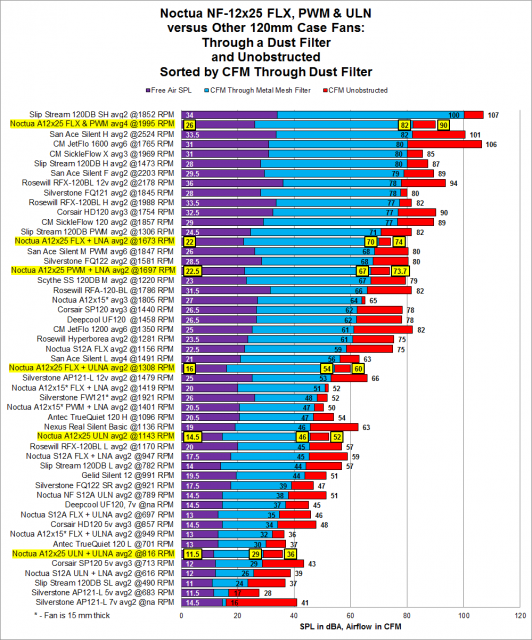 They pulled 82 cubic feet per minute through a dust filter while the fans made only 26 dB of noise, which is a lot quieter than all the other high output case fans. Even though they were a little bit apart, the NF-A12x25 PWM and FLX with Low Noise Adapters made fine case fans while only making 22-22.5 dB. Using the Ultra-Low-Noise Adapter, the FLX pulled a fair amount of air through while being very quiet at 16 decibels. 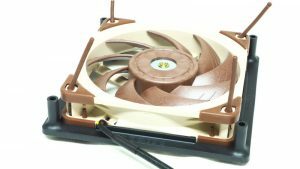 The only comparably quiet case fan was the ULN. 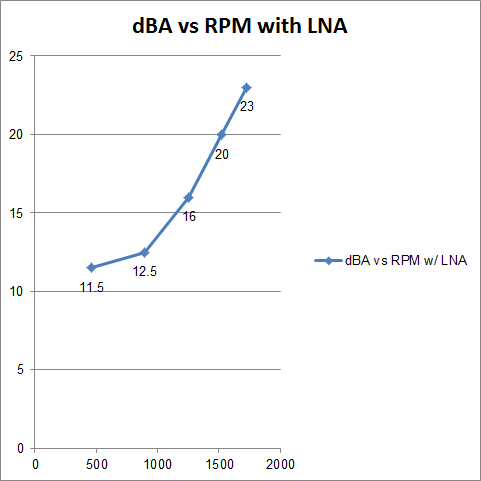 The ULN with ULNA made only 11.5 dBA — next to silent. 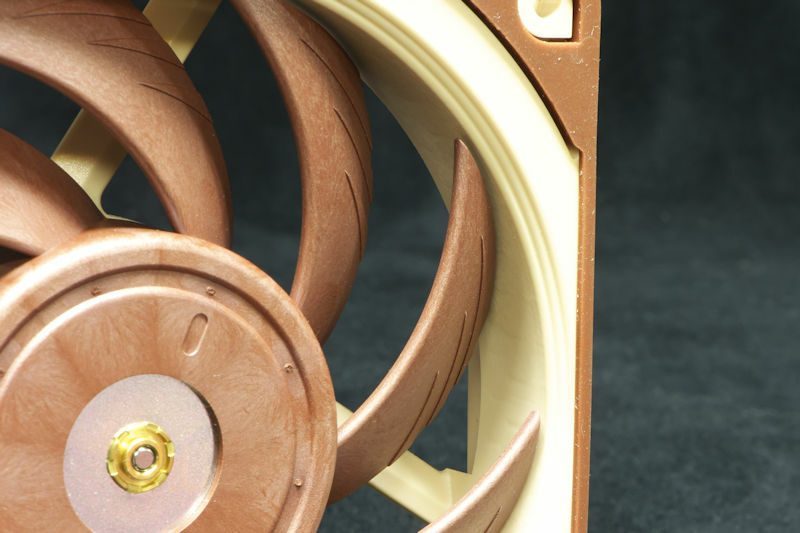 And then we have fans mounted on our proxy for a heatsink, the 16 fins per inch 140 mm rad. Overall, the A12x25 results were spread, but they were always among the quietest fans at their CFM class. Next up are the results with the A12x25 screwed down with its gasket on a 120 mm rad. The remarkable thing about these fans is that they equaled and sometimes surpassed the airflow on the heatsink proxy. You wouldn’t think that would be with the increase in fin density to 30 FPI, but there it is. It seems the openings at the sides on the HSF proxy negated the difference in the fin density. These fans are quiet to begin with but the PWM fan is silent at idle. Sure it can ramp up, but it stays at idle most of the time. As for the ULN or the FLX with an ULNA, don’t bother with putting them on a rad. 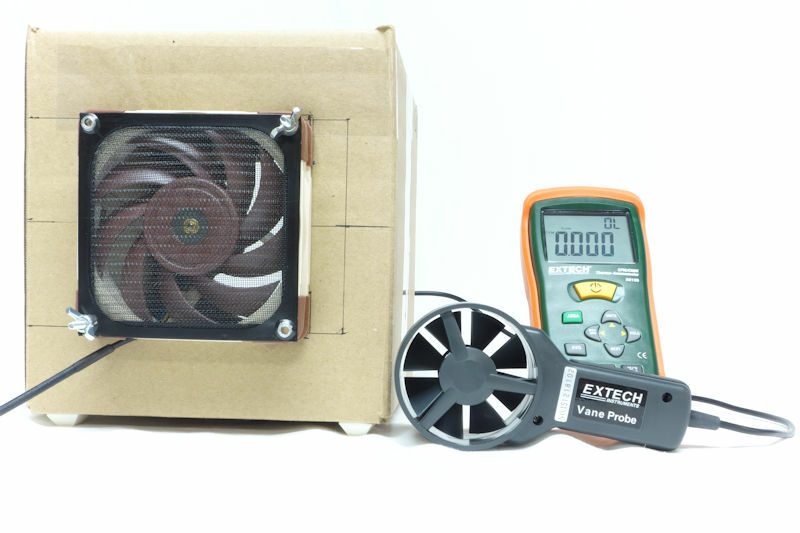 For our last comparison chart, we will look at this fan using the 120–140 mm adapter on a 30 FPI 140 mm radiator. 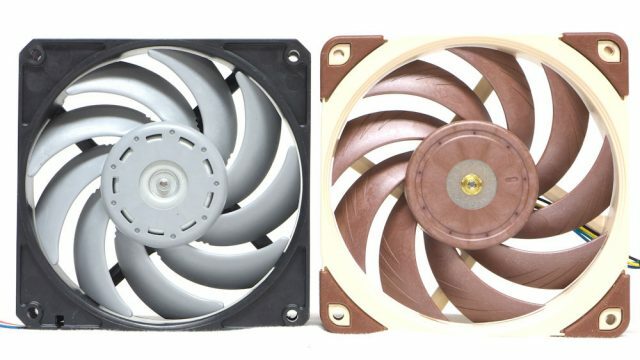 Now, this is a tough challenge for a mere 120 mm fan, but how does it compare? The chart shows that the PWM and the FLX finish above the middle of the pack of 140 mm fans. 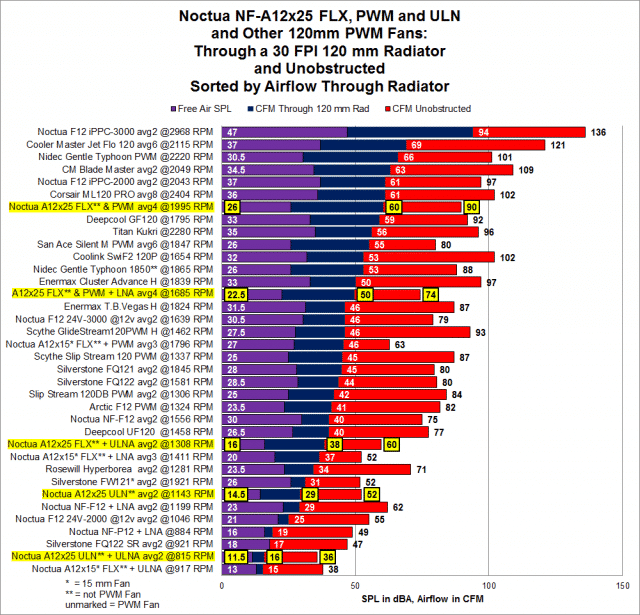 The full-speed FLX and PWM fans pushed through 56 CFM of air while making only 26 dBA of noise. 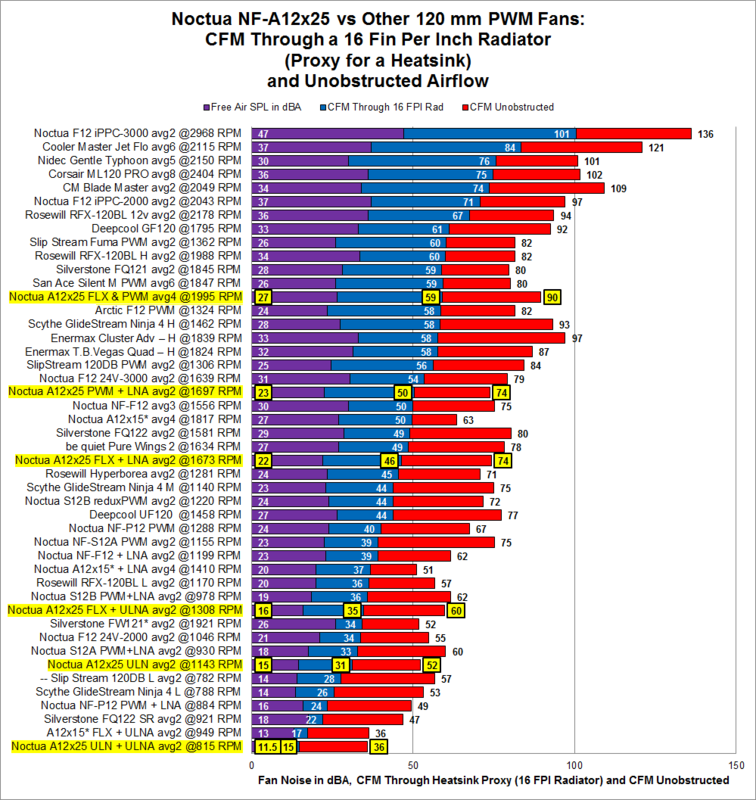 The CFM measurement was better than most 140 mm fans and the SPL was lower than all but a few. Those all pushed a lot less air. The chart also shows that an FLX using an LNA was OK but using an ULNA is fruitless on a 140 mm rad. For this reason, the A12x25 ULN was not included in testing with the NA-SFMA1 on the 140 mm rad. I would have liked to measure the sound these fans make on radiators since these are very quiet fans. 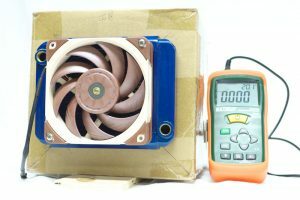 But I cannot measure noise from the fan alone. The airbox vibrates like a drum so that measurements would be intrinsically inaccurate. So users will have to receive a qualitative impression: these fans run quietly on their rads. Now we look at PWM. 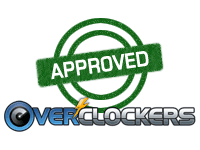 We can range from just over 200 RPM at 10% PWM to over 2000 RPM at 100% PWM. We can also see that with the LNA the curves split, with the speed peaking at just over 1700 RPM. 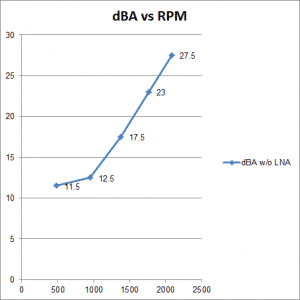 Next, we will look at dBA vs RPM. The first chart shows the Sound Pressure Level produced by the PWM fan. 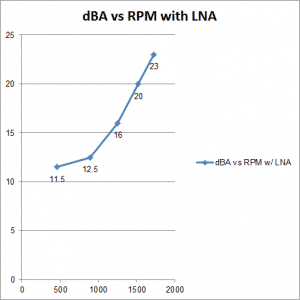 It ranges from a near-silent 11.5 dBA to 27.5 dBA, which is not loud. 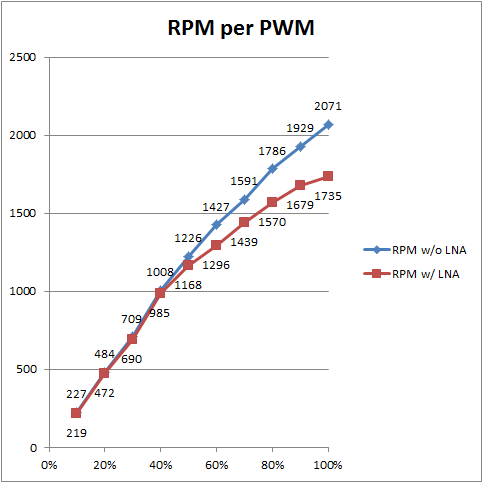 The markers are placed at 20% points of PWM Duty, from 20% to 100%. We can see how quiet this fan really is. The last chart shows the SPL produced at various RPM’s. 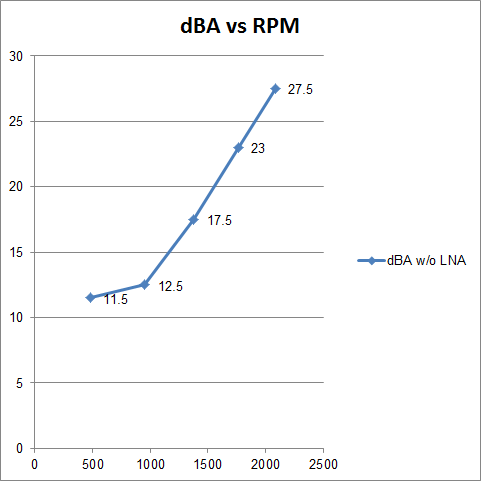 Again, the markers run from 11.5 dBA at 20% PWM intervals to 23 dBA at 100% PWM. NF-A12x25 FLX at Amazon: $29.90. At Newegg: $29.90. NF-A12x25 PWM at Amazon: $29.90. At Newegg: $29.90. NF-A12x25 ULN at Amazon: $29.90. At Newegg: $29.90. NA-SFMA1 at Amazon: $11.90. At Newegg: $11.90. 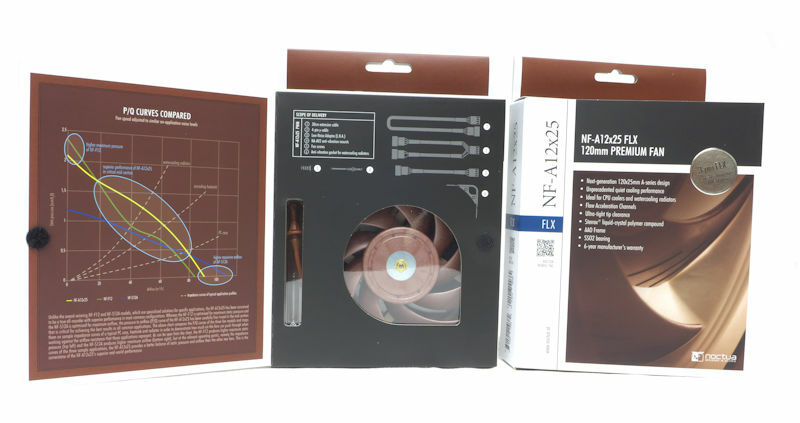 Noctua has combined a lot of features to bring us the NF-A12x25. 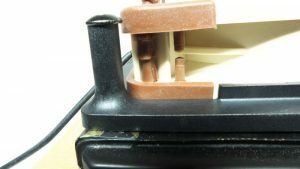 It was built around the concept that the blade tips would run about 0.5 mm from the frame – a tight clearance intended to deliver more static pressure and lose less airflow through the blowback. To pull this off the OEM used a whole box of tricks: they made it from a more rigid plastic called Sterrox, used reinforced bearings, stiffened corners, and tightly swept blades. When one places a gasket on the fan before putting the fan on a rad, it does two things. First, it seals the gap between the fan and the rad, forcing more air through the rad. This is aided by the tight clearance between the blades and the frame. The gasket also reduces the vibrations produced by the fan. So one has a high-performing quiet fan. Add to this Noctua’s six-year guarantee and one has quite a fan. If one uses an NA-SFMA1 they could put this 120 mm fan on a 140 mm rad. This combo makes a surprisingly good pseudo 140 mm rad fan, and quieter than most. 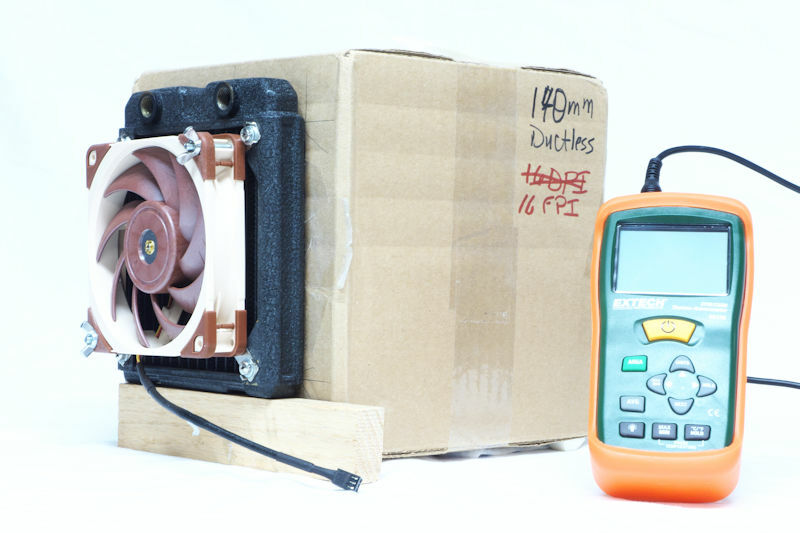 The key to this fan’s performance is that throughout its operational range it is quieter than most competing fans. 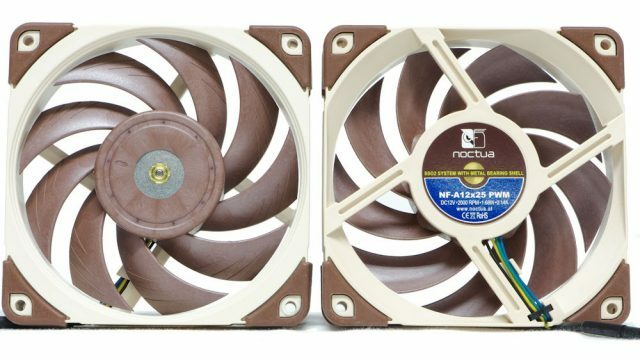 As usual, these fans from Noctua are a bit on the high side, price wise, but one pays for quality and Noctua delivers.